So far, we have assessed your saw to see whether it's worth saving, and having done so, we have completely disassembled the saw to include removing the back, cleaning the separate components and repairing the handle. Now it's time for reassembly and retensioning. 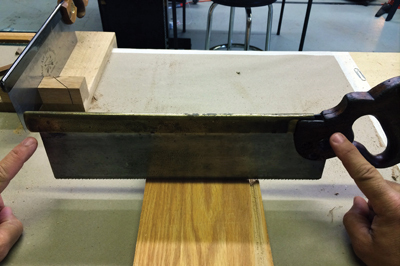 The following procedure illustrates how to bring everything into correct plate tension, which will make your old saw deliver a straight and clean cut. The advantage of owning a saw with a traditional folded back is that you can completely break down the tool, restore/repair and reassemble the parts into better working order than perhaps even when it left the factory. When it comes to saws, the trick is knowing how to manipulate the sawback, which is sprung - mechanically - onto the spine of the thin sawplate. 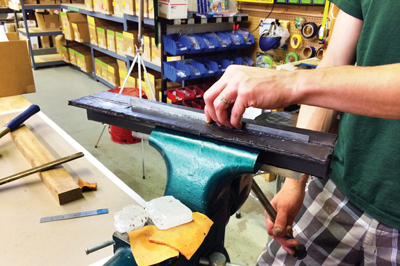 Cinch your sawplate tightly into the pair of leather-lined angle iron pieces and clamp in your vice. The idea here is to leave about 6mm of spine exposed above the surface of the angle iron before mounting the sawback. Orientate the plate so the etch, or decorative side of the plate, is facing you and that the toe of the plate - leading the direction of cut - is on your left and that the heel - the handle end - of your plate is on your right. Ensure the logo side of the sawback faces you as well. There is no sense in reinstalling the sawback backwards, right? The next step is to tap the sawback onto the toe end of the spine. Start by aligning the toe end of the sawback's aperture with the top corner of the spine and gently tap it on with a light dead-blow mallet. You'll feel the lips of the sawback grab on, as the sawplate ever so slightly spreads them apart. Tap the sawback down until it's in about 6mm and then start walking the sawback onto the rest of the spine. You'll find you occasionally need to re-seat the sawback at the toe end, or else you'll cantilever the sawback entirely off - so watch what you're doing. When the sawback is about halfway mounted, tap the heel a few strikes to shove the sawback forward of the toe end of the plate by about 6mm. This is a deliberate, yet temporary alignment, which creates an air gap between the back edge of the sawback and the back wall of the mortise in the handle receiving the plate/back assembly when you mount the handle in the next step. You'll see why we're doing this in a moment. For now, seat the rest of the back onto the spine. Take care NOT to seat the sawback so deeply onto the sawplate's spine that the top edge of the spine comes anywhere near the inside fold of the sawback. That air gap between the spine and inside fold must be maintained for retensioning purposes. By the time you are finished, your sawback should be positioned slightly above the 'grime-line' where time and rust has etched an outline, reflecting the original seating between the plate and sawback. Once you have your sawback nicely positioned, you are now ready to remove the plate/back assembly from the vice and angle the iron to reattach the saw handle - see, it's all beginning to come together nicely. Again, note that you have deliberately mounted the back such that there are two air gaps in relation to how the plate/back assembly fits with the handle: one air gap between the underside of the sawback where it is intended to seat on the floor of the mortise receiving the plate/back assembly, and another air gap between the heel end of the sawback and where it is intended to seat against the back wall of the mortise receiving the plate/back assembly. This may look odd and cause you to panic, but don't worry as we're not going to leave it like that. Bear in mind that the two air gaps will allow you room to make the final back adjustments and associated retensioning with the handle in place. 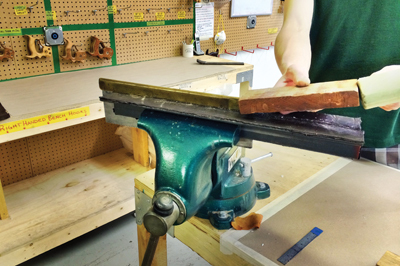 Now mount your sawback into the vice where the handle clears the angle iron. Grab a piece of scrap wood and rest it against the toe end of the sawback. We're now going to tap the sawback laterally toward the handle to close up the air gap between the back edge of the sawback and the back wall of the mortise receiving the plate/back assembly. 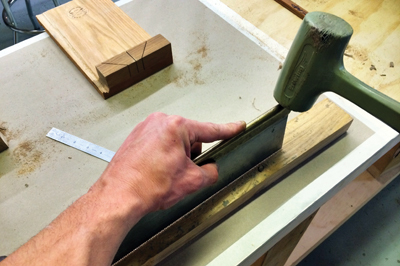 Tap it lightly with your mallet until you close up the air gap - a pretty straightforward procedure, but don't overdo it. Too hard of a whack could fracture the handle. Just barely kiss the parts together. Note that this lateral shift evenly distributes clamping tension along the spine in consonance with the next step. 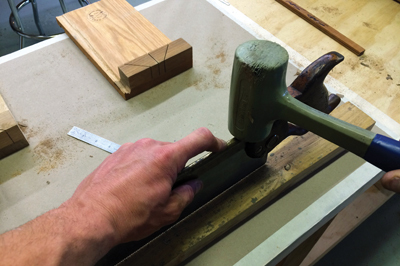 Finally, make alternating taps at the heel and toe, which seats the underside of the sawback onto the floor of the mortise receiving the plate/back assembly and again evenly distributes the clamping tension of the back along the spine. What you may have seen once as a kink along the toothline is now arrow-straight. Take measurements with your ruler to assess distance between the toothline and the underside of the sawback. 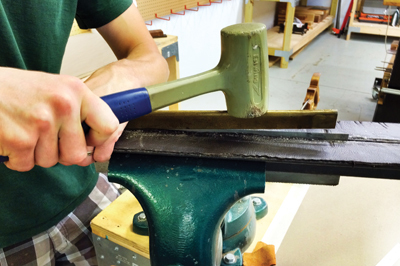 Tap the toe end of the sawback until you have achieved equal plate depth from heel to toe. If you are a fan of a canted plate - less real estate at the toe compared to the heel - to avoid overcutting the far side of your work when making dovetails or tenons, now is a good time to tap the toe end of the sawback about 3mm deeper onto the plate compared to the heel end. Don't overdo this and you sure as heck don't want to shove the spine all the way up into the inside fold of the back. Remember, having an air gap between spine and inside fold is necessary to allow you to make occasional retensioning taps fore and aft on call. 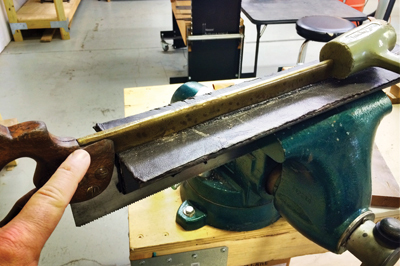 Remember that the key to reassembling the separate components of a vintage backsaw lies in creeping up onto the final measurements. 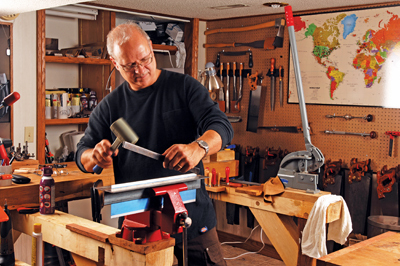 Avoid heavy-handedness and your saw will thank you for it.